Netted: Jackson Baluku after he was arrested during a joint operation mounted by NRCN and police. Courtesy photo. An unrepentant and habitual trafficker in wildlife trophies has again landed himself in police custody after being netted in a police operation on Monday. Jackson Baluku 42 was arrested in Mbarara town. In his possession was 33.8kgs of ivory with an estimated worth Shs13.5 million which he was allegedly trying to sell. Baluku a motor vehicle broker and resident of Lower Zone Base Camp in Kasese Municipality, Kasese District, was arrested during an operation conducted by the Natural Resource Conservation Network (NRCN) in partnership with Mbarara police. Jushua Poro, the NRCN media relations officer, said the suspect was arrested after a tip-off from concerned residents. 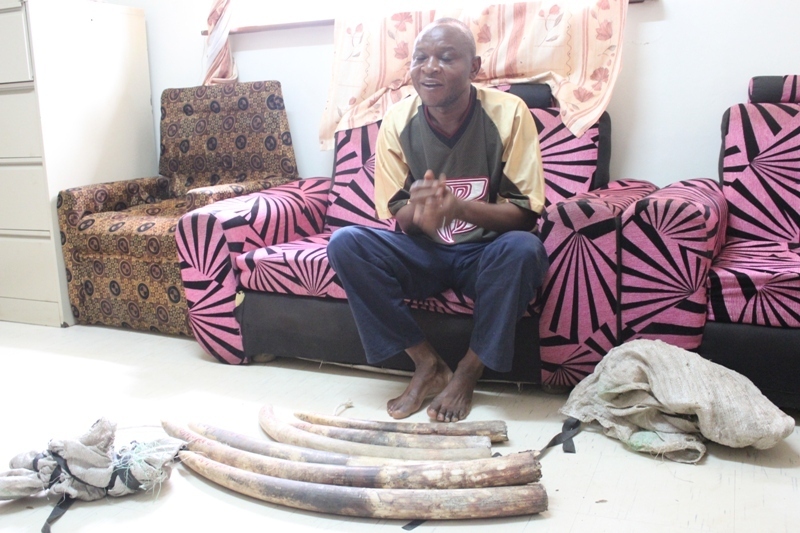 Poro said this is not the first time Baluku is being arrested over illegal dealing in ivory. In 2015, the suspect together with four others were arrested and convicted for being in possession of ivory. In the same year, Baluku was arrested for allegedly providing a hyena’s liver which was could have been used to poison somebody. Leonard Massa, the NRCN head of legal and prosecution, said Baluku will be charged with unlawful possession of a protected species contrary to Sections 30 and 75(b) of the Uganda Wildlife Act CAP 200. Massa said that if found guilty, Baluku will pay a fine of not less than Shs1 million or serve a five-year sentence.